Material properties are influenced not only by electrons and their correlations, but importantly by the degree of disorder as well. 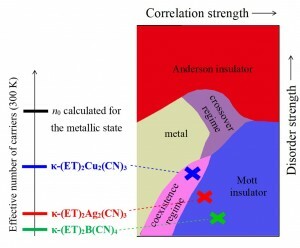 The interplay between electron correlations and disorder brings about many fascinating phenomena which also include metal-insulator transition and the so-called Mott-Anderson localization of electrons. In literature one may find several theoretical approaches to Mott-Anderson localization which can in principle be summarized by phase diagrams describing the level of disorder and strength of the electronic correlations. However, from the experimental point of view, the Mott-Anderson localization phenomenon has been poorly investigated since it is generally very difficult to change the strength of the electronic correlations and/or disorder of a particular chemical system in a controlled way. For this work the authors have chosen a family of κ-(ET)2X compounds, where ET denotes the organic molecule bis(ethylenedithio)tetrathiafulvalene and X is an inorganic anion. This family of compounds is ideal for the study of Mott-Anderson localization since electronic correlations and disorder change with different anions X. Moreover, the fact that these compounds are magnetically disordered makes alleviates some of the experimental complications due to magnetic ordering which otherwise usually accompanies the Mott insulating phase. Organic Mott insulators from the k-ET2X family and their position in the theoretical Mott-Anderson phase diagram based on experimental values of their effective charge carrier concentrations. This work describes a systematic study of dc resistivity and Hall effect on three compounds of the κ-(ET)2X family, X = Cu2(CN)3, X = Ag2(CN)3, and X = B(CN)4. Despite great similarities in chemical and crystal structure, these three materials are very different with respect to dc resistivity and Hall coefficient which can be attributed to different degrees of intrinsic disorder. Surprisingly, the results show that the material with the largest degree of disorder, Cu2(CN)3, exhibits the smallest dc resistivity and the highest effective concentration of free charge carriers, i.e. it is nearest to the metal-insulator transition. On the other hand, the material with the lowest degree of disorder, B(CN) has the largest resistivity and the lowest effective concentration of free charge carriers, meaning it is farthest from the metal-insulator transition. Such unexpected and unintuitive results are interpreted within the theory of Mott-Anderson localization as a consequence of disorder-induced localized states within the correlation energy gap which provide a new channel for conductivity and enhance the effective concentration of free charge carriers.